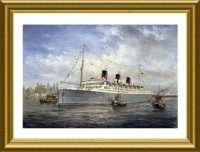 Back in the golden days of ocean travel, to sail aboard one of the great trans-Atlantic liners was something everyone dreamed of doing. Of all those great Atlantic liners, none was more famous than the celebrated Queen Mary. 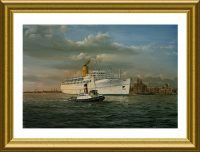 Many artists have done paintings of her arriving and sailing from New York and Southampton, but we wanted something a little different to show the ship in all her powerful glory on her maiden voyage… her speed, power and pride, which is exactly what Robert has managed to capture in this magnificent painting. 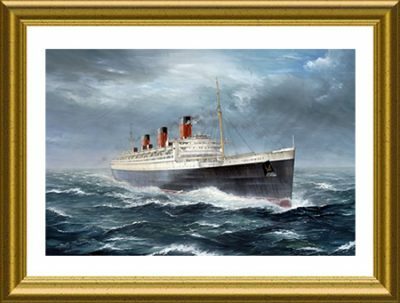 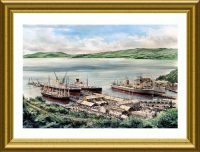 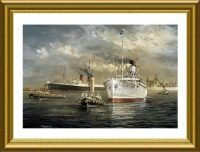 The size of this painting, framed in antique guilt is 28″ X 36″ inches and is featured on the front of episode 13 in the Great Liners Video series, “The Queen Mary“.